Excellent for bar codes, point-of-sale and price display. Change labels as often as necessary without messy adhesive build-up. 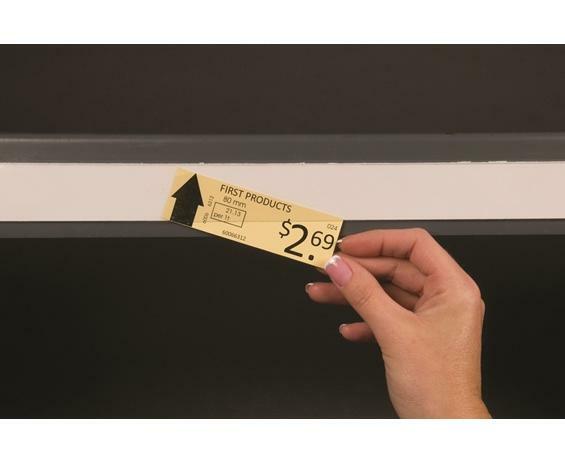 Stick the Slip•Strip™ one-piece label holder anywhere you need to mount or display bar codes, messages, prices or any other information. "Slip" label, sign or message through the open edge of the holder. Holds all sizes and types of labels. Made of heavy duty PVC with clear face, white backing and an aggressive, long-lasting adhesive. Adheres to any clean, dry surface and is easily cut to required length. Custom colors and sizes available. FOB Shipping Point.